Yesterday, we found ourselves reading this article and banging our heads against our keyboard. How could these presumably intelligent people not realize this guy was a total snake and liar? And how the heck did he end up getting another job after being fired at a brand as big as Rosewood? We’ve worked with snakes, liars and thieves both in-house and at various PR firms and they usually have a lot of things in common. We’re not trying to pretend that we can always spot them a mile away or that our instincts were 100% right but some of them were so obvious, we couldn’t believe everyone else in the room wasn’t rolling their eyes and seeing Russia on Sarah Palin’s porch. So here are a few obvious signs that the PR practitioner or social media “evangelist” you’re meeting with is actually Keyser Soze (and no, the first sign isn’t that they work in PR, harty har). They are a walking, talking jargon machine – “skill set,” “ROI,” “proprietary algorithm,” “mocial” (<- yeah, that one is plain vile). Words that sound like nails on a chalkboard. We’ve all pretty much figured out that the overuse of jargon is often to disguise the lack of saying anything with substance so don’t let their silver tongue fool you into thinking they know what they’re talking about. The more jargon used, the less they know. They call themselves an expert. Or a guru. Or an evangelist. Or any other such obnoxious designation. No one is a social media expert. Social media is still evolving and has hardly defined itself, let alone created experts and gurus. Let their work, and results, signify their titles. And call them out on it. “So what makes you an expert?” Don’t let them respond with their Klout score. A Klout score is as meaningful as a World’s Best Dad mug. If someone is name-dropping all over the place, it means a couple of things. One, they don’t have enough currency and value in themselves so they need to use other names to make up for it. Two, they are hoping you will be impressed by their big name, kind of like how a cat gets distracted by lights, and you won’t realize they’re talking out of their arses. Three, most people who name drop are glorified socialites, and all they’re doing is going to cocktail parties for the free booze and the hopes that they’ll get noticed by the producers of that awful Bravo Silicon Valley show. The bigger names that they drop, the more unlikely it is that the names know who they are. Do you really think Sheryl Sandberg, Walt Mossberg and Jack Dorsey have time to rub elbows with us plebeians? We leave you with these two words: Shirley Hornstein. Long gaps in resume/work experience can be tricky as some people do have a legitimate reason for having a gap in their work experience. Things like family obligations, a serious career change, or maybe they just needed to unwind are all valid reasons and shouldn’t be held against anyone. But if you see large gaps, like the GameStop guy who left off 7 years in his CV to get hired by Rosewood, you should wonder why and you should be very suspicious. Most likely, they’re leaving off a former job where they left someone deeply unhappy or swindled millions of dollars. They promise you the sun, the moon and the stars. We will do everything we can to move mountains for our clients but we’ll never promise to move said mountain (and really, who can move a mountain except Zeus?). Don’t believe anyone who promises you anything. Listen to what they can do for you but as soon someone says the word “guarantee,” you should run for the hills. There is no such thing as a guarantee in the crazy world of PR, and if they are guaranteeing a press hit or brokering a relationship, whatever it might be, we can guarantee you that they’re lying. They like everything you’re saying and doing and don’t have a single bit of criticism and OMG you are amazing and a genius and soooo good-looking. 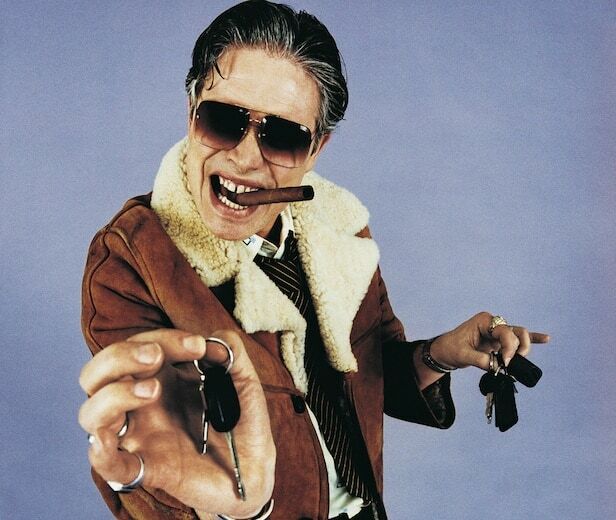 You don’t want a Yes Man for your PR firm. Drinking the kool-aid is not a good thing. Of course, you want someone who is passionate about your company, who clearly looks like they care about you and what you’re doing, and has genuine enthusiasm. But someone who nods their head at everything and doesn’t seem to offer you any counterpoints is someone who is blindly agreeing to anything you say so that your ego will be stroked and you’ll drop big bills into their wallets. A PR firm is an advisor who should respectfully counsel you if they think you’re going down the wrong path. By the way, if none of these seem like red flags to you, then we’d love to evangelize some SoMoLo ROI with you, sipping mocktails with Marissa Mayer at our beachside resort and guaranteeing that we can get you the front page of the Wall Street Journal. Call us! So why does this matter in the long run? 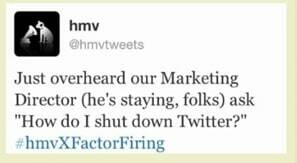 The HMV case stands out since their corporate Twitter account is broadcast to over 60,000 followers. What is really noteworthy is that this seems to be part of a larger trend in which disgruntled employees who have just gotten the axe are taking to social media for their final kiss-off. Google’s former engineering director, James Whitaker, blogged about his last months at his job “as a whirlwind of desperation, trying in vain to get my passion back.” Sallie Krawcheck, once the most powerful woman of the banking world, tweeted “More on the theme of big bank complexity: not Too Big to Fail, but Too Complex to Exist?” when she was ousted from Bank of America. 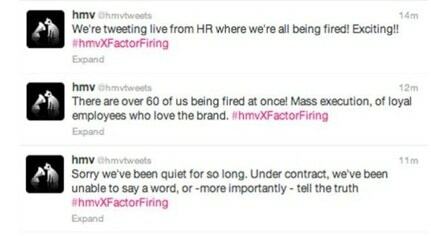 So should sending out a revenge tweet after your boss sacks you be the default recourse for angry employees? Being fired can be deeply emotional and while you’re feeling a knee jerk reaction to spill all the dirty office secrets, remember the 2-2-2 rule: how will that angry tweet affect you in two days, two months, and two years? In every job you still have the option to control how you want to remember your last day, whether it’s a forced resignation or a voluntary one. Try not to burn all your bridges; you might need some of them for future interviews/references. Who wants to give a good recommendation for that crazy hothead who blasted their workplace?